ISAR540 - USB Isolator with ADUM4160 and Ultra-Low-Noise DC-DC Converter muRata NXE2 (double power in comparison with muRata NXE1). ISAR540 is an USB isolator for interconnection of sensitive USB devices, such as USB DACs or Weather Stations. 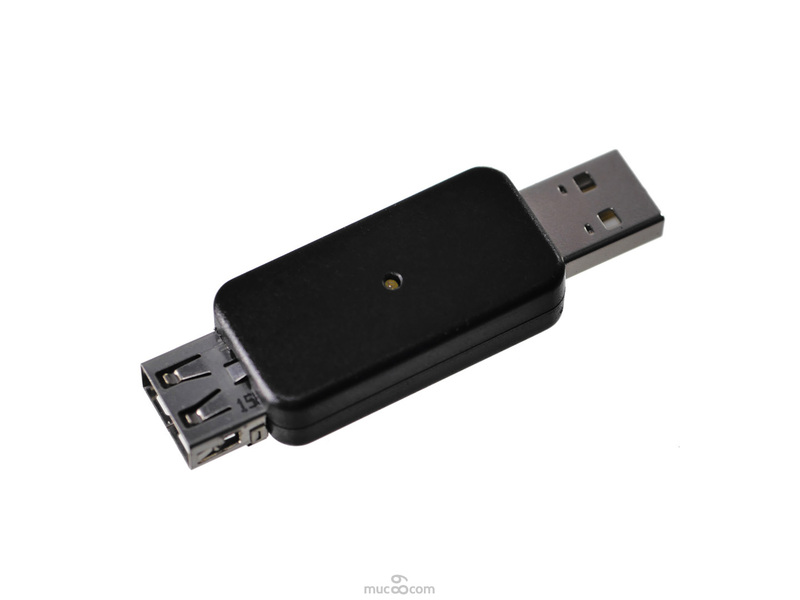 It will isolate the power from the USB host and the connected device and provides a cleaner 5V DC USB voltage to the USB device, which can be loaded with up to 2000mW. The isolator will create a new ground for the USB device so that it doesn't have to share ground with your computer and other devices you might have connected in the same premise. USB devices with their own power supply can still be connected. The effective isolation of the USB device from the host most often ensures not only a measurable, but also a hearable improvement when using it together with an USB DAC. Without isolation, the digital signal processing in the computer otherwise impacts stability of ground signals quite dramatically. As soon as an audio amplifier with its own ground and its own power supply is connected for analog audio amplification, current flows for potential compensation between computer and amplifier on common ground signals. This current will then most often be heard as noise, high frequency whistling, humming, howling or chirping. Some applications on the computer, which sometimes generate pretty intense noise are scolling in the internet browser or playing videos - and its related CPU- and GPU-intense signal processing. 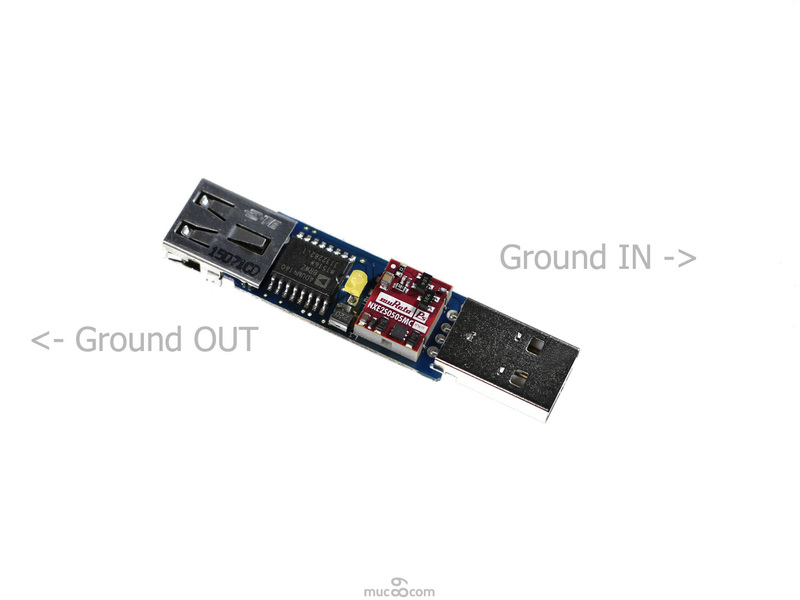 When connecting a Weather Station with its own grounding or relatively long USB cable outdoors, sometimes connection between Weather Station and computer suffers. A new ground - to be more precise, an isolation of computer-ground and device ground - adds clarity and cares for a strict separation of different ground signals. Therefore, ISAR540 is the prerequisite for a high quality sound experience and reliable data connection. Unfortunately, all DC-DC converters, not only those for USB isolation, quite often generate a new little problem with their ripple and noise on the new USB ground by themselves. While most USB isolators are based on simple DC-DC converters, ISAR540 on the other hand utilizes a high-end converter muRata NXE2. This fact improves sound quality significantly. NXE2 by muRata specifies its output ripple & noise with 55mVp-p. ISAR540 in addition utilizes a L-C circuit which lowers noise at normal load to 5mVp-p.
USB Full Speed with 12 Mbps is good enough for DAC sampling rates up to 96kHz at 24bit. DAC resolutions with 192kHz or above or USB Audio 2.0 connections will not be supported by ISAR540. Some of the DACs with higher resolution on the other side, offer the option to run the DAC in USB Audio 1.0 for up to 96 kHz. Please see below for a description how to test your USB DAC interface before purchasing ISAR540. Supports USB adaptive mode and USB asynchronous mode. Works for example with USB DACs with Silicon Labs CP2114 codec (HIRESFI USB DAC 5102), Savitech SA9023 USB interface or GFEC Tenor USB codec. ISAR540 also works with ASUS Xonar Essence III in USB Audio 1.0 mode. Removes high frequency distortions from Rocksmith Real Tone cable: Guitar amplifiers connected to your E-Guitar via Y-Cable retain crystal clear sound - even if the guitar is connected to the USB port of your PC via Real Tone Cable. ADuM4160 does NOT work with Line 6 Pod HD500, Presonous Audiobox 1818VSL, M2Tech HiFace Two, Focusrite Scarlett and those DACs, which exclusively work in 480Mbit USB high speed mode. 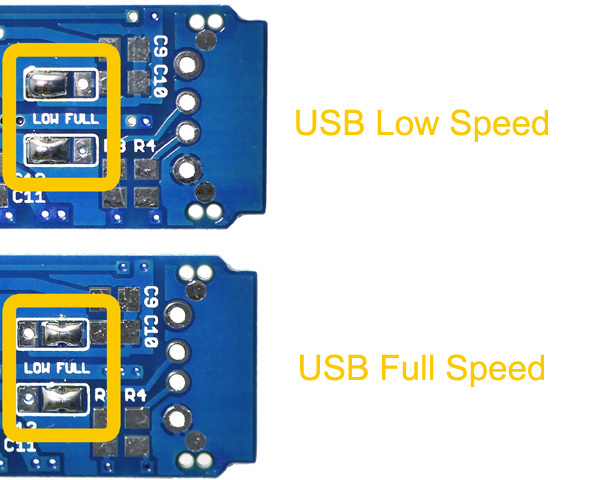 DAC in USB Full Speed or Low Speed Mode? If you like to find out without the manual, if your DAC runs in USB full speed mode or if it might be possible to switch it to USB full speed mode at 96 kHz or below, a small tool might be handy. With SIV - System Information Viewer - for example, this check can be performed quite straightforward and without big hassle or software installation. Load ZIP file, extract in folder, run from there. Then press USB button in the tool - done. The following link points to the homepage of the editor. Virus checked versions will be found at heise.de, chip.de or others.